Road Sweet Road ~ The Bucky Channel - The World of Sports from Wisconsin's Perspective. No John, it's true. 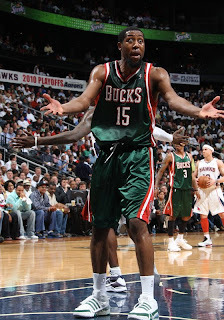 The Milwaukee Bucks are only one game away from the second round of the playoffs. I know I'm surprised too, but this is not a fairytale. I have to say Wednesday night's playoff game between the Bucks and the Hawks was one of the best NBA games I have seen in awhile. Both teams played awesome defense, so it would come down to who could make big shots. Well Delfino wins the award for that Wednesday night. With 1:15 left in the game, a Delfino three put the Bucks up four. From there they would make the free throws it took to get the 97-81 victory on the road. Brandon Jennings said that to be a good team you must win on the road. Well he put his game were his mouth was in the first quarter Wednesday. With the Bucks starting slow Jennings decided to take the quarter over on his own. He scored 12 straight Bucks points in the the quarter, and finished the quarter with 14 points. The Bucks led by one at the end of the first quarter. In every game in this series whoever leads after the first have won the game, and that was no exception in game five. The second and third quarters were not good for the Bucks on the offensive side of the ball. It was a little because the Bucks were just taking bad shots, but it was also Milwaukee not getting generous rolls off the rim. It seemed the Hawks were rattling in shots, but every shot the Bucks took would go half way down then bounce out. Luck was not on their side during these two quarters, and the Hawks took advantage of it. The Bucks trailed 69-61 after three quarters, and things didn't look good for the Bucks. If they were going to win they had to have a huge fourth quarter. Well, a huge fourth quarter is exactly what the Bucks had. It wasn't a huge quarter from start to finish but it was a huge quarter from about the 4:09 mark to the end of the game. After the Hawks took a nine lead with 4:09 left Skiles called a timeout. In the huddle he told the guys "We're still in this, and we haven't played our best ball yet". Boy was he right, because this team played with a lot of heart down the stretch. Salmons scored 7 of the Bucks next 13 points, as they went on a 13-0 run after that Skiles timeout. How this guy not win coach of the year I will never know. He did however put belief into this team, and the team gave the fans a reason to believe. You know the rest as the Bucks would go onto win 91-87, and take a 3-2 series lead. * Brandon Jennings is the fuel to this fire, I really believe that. He got off to that hot start in the first quarter to help out the team when they couldn't get a jump shot to drop. Also late in the game he made his four final free throws to clinch the win. A rookie at the line in a swing game, and he knocks them down like he has done this before, are you kidding me? This guy is awesome. He finished the game with 25 points, 4 rebounds, and 3 assists. Another solid playoff game for this young buck, pretty good for a guy in only his fifth career playoff game. * Luke Ridnour makes big shots. Period. He doesn't score in bunches so you may not notice his shots, but whenever the Bucks go cold for a bit he always seems to make a shot. He finished with 15 points, and 4 steals. He was 5-7 from the field, 1-1 from three point, and 4-4 from the line. As you can see when he does shoot it usually is a good shot. * Ersan Ilyasova played a huge role late with his hustle down low. He made the basket to put the Bucks up 83-82, before Delfino hit the three to put them up for good. The only reason Delfino got a chance to make that three is because Ilyasova got the offensive rebound. He didn't do this all game I'm not sure why, but he came through in the clutch when the Bucks really needed him. He had seven rebounds for the game, four of them coming on the offensive side. * Joe Johnson didn't put up his normal numbers Wednesday, and John Salmons had a lot to do with that. Salmons had a rough night shooting too, but he really worked hard on Johnson. He was in his face most of the night as Johnson was not getting good looks. That frustrated Johnson, which led to him getting his sixth foul when he was calling for a charge. It's always nice when he is not in the game. * Al Horford was huge for the Hawks in game five. He finished with 25 points, 11 rebounds, and a late three pointer. He did bank in his three pointer, but that put some pressure on the Bucks late. Good thing Jennings made the free throws so that Horford's three didn't help the Hawks make a comeback. Horford also worked Thomas and Gadzuric out of the game with foul trouble. Now these two teams head back to the Bradley Center Friday night at 6:00 central time. The Bucks will be looking to close out the Hawks. My guess is the Bradley Center will be louder than ever as this is a huge game for the Bucks. Milwaukee needs to just play their game, and go out to get the job done. I really feel that this team has a great chance to end this series Friday night. Only time will tell, but this team could be a huge surprise in the 2010 playoffs.